There is a certain amount of trepidation that comes with ordering a custom made suit online, but I decided to take the plunge as Magnoli Clothiers' version of this suit is universally hailed as the best option out there. The ordering process was simple and the requested measurements seemed quite comprehensive. The customer service I received was excellent and very responsive, especially considering the time zone separation. My suit was delivered yesterday and, although it was very late when I arrived home, I immediately tore open the package in order to check it out. The small details on this suit - the buttons, the scallop of the breast pocket, the width and color of the pin stripes - are what set it apart from lesser competitors. The suit looked perfect as I laid it out and inspected it, but the quality I paid for truly became apparent when I tried it on. Every single measurement of this suit, from the fit of the jacket, to the hem of the pants, is absolutely perfect. I took it for granted that some minor adjustments would need to be made, but the only thing this suit needs is a quick pressing at the dry cleaners. This truly a custom made suit produced by a talented tailor. 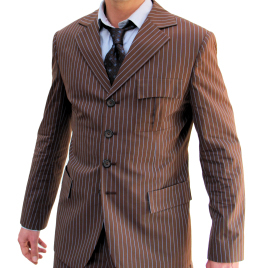 Whether you are a Doctor Who fan, or are simply in the market for a unique custom suit, get your measurements taken and order without fear. You will not be disappointed.